Concrete is a popular paving material for creating so-called ‘solid-surface’ driveways, and is generally used to provide a sloped ‘cover’ for efficient water run-off. Concrete surfaces are low-maintenance as well as more cost-effective than materials such as asphalt, gravel brick or cobblestone. What’s more, you’re spoilt for choice in terms of design finishes that you can apply to make your driveway more aesthetically appealing, and to complement the architecture and landscaping of your home. Concrete is also very durable and easy to keep snow-free in winter, but on the downside, it doesn’t fare well in extremely harsh winter conditions and cannot be relayered in the event that it is damaged or cracks. This usually means you’d have to rip up and remove the entire surface altogether and install a new concrete driveway. (You can also fix cracks by filling them and resurfacing the driveway). Another potential problem you may face with concrete is that it easily shows up stains (such as oil or petrol stains from your vehicles) – and they’re a nightmare to get rid of. Plain old concrete is pretty ‘bland’ and lacking in character, but this can easily be remedied by the wealth of concrete design choices that are available on the market. One way of snazzing up your driveway is by pouring coloured concrete, which is available in a wide range of colours to suit the design and landscape of your home, producing a rich, hard-wearing and even colour. Another option is to add colour and/or patterns into new or existing concrete by means of a stencil pattern system. Strong, durable and reasonably priced, this allows you to add colour, patterns as well as texture to your concrete surface. The finished product will emulate the look of brick or stone, with a grout line offering contrast, while a fleck finish can provide the appeal of exposed aggregate, tile, pavers, cobblestone or herringbone designs. How much does it cost to install a concrete driveway? In New Zealand, a standard driveway on an accessible residential site will set you back around $190 per square metre. That includes everything from start to finish, including labour, materials delivery, creating the sub base, pouring the concrete and adding the finishing touches. Please bear in mind that factors such as the thickness of the surface, the preparation of the concrete and choice of design finishes (colour, type of aggregate…) will also affect the overall cost. Before pouring the concrete, grass and other plant matter needs to be removed, a solid soil base created and wooden forms placed around the boundary. Using reinforcement such as welded wire or rebar, the forms are then rapidly filled with wet concrete and finished. The most important part of the process is the curing, where the concrete reacts chemically to strengthen and harden the material. It is crucial to consider the weather – ideally 21 degrees Celsius with a damp surface. In cool weather, curing will take longer and in hot conditions, the curing process needs be slowed down by regularly dampening down the surface. It’s also important to wait a week or more post curing before driving on the driveway, a month before parking heavy vehicles there and one to two months before sealing the concrete. How do I make my driveway last the distance? Your driveway should last between 25 and 50 years – provided you look after it well. Basically all you need to do is regularly clean it with a hose and brush, and apply a concrete sealer at least once per annum to protect it against staining and fading. The sealers are available in kaleidoscope of colours and can be used on plain, coloured and textured surfaces. To prevent concrete from cracking, you once again need to be ‘weather wise’. 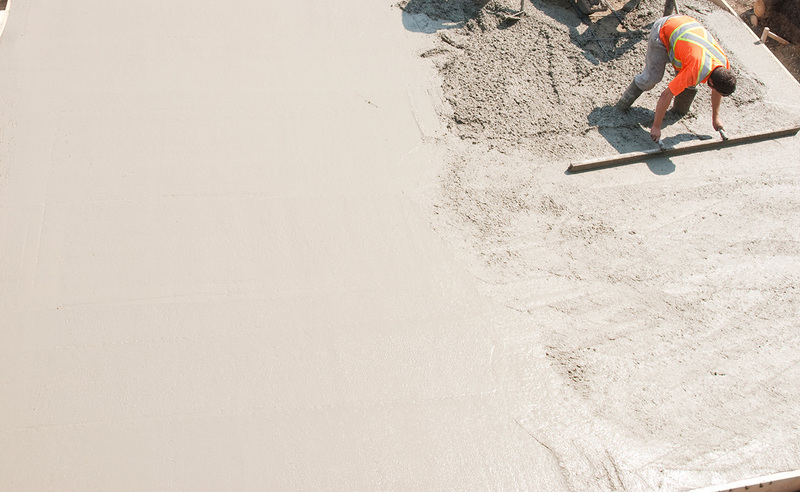 In summer (especially those ‘scorcher’ days), never pour concrete at the hottest time of day and also dampen the base down the night before pouring the concrete. Conversely, never pour concrete in temperatures below 5 degrees Celsius as freezing can prevent concrete from setting. (For more hot and cold weather concrete pouring tips, see our article FAQs for Driveways). If your concrete driveway is already cracked or looking a tad dilapidated, concrete resurfacing (using a spray-on system), will create a new decorative finish on the concrete. It can be used on new or older surfaces, is economical and comes in a host of colours and finishes to choose from. You can resurface a concrete driveway as early as four weeks after curing and the coats bond fast to create a texture, slip-resistant, durable, abrasion-resistant and stylish surface. Concrete pavers – the ultimate solution? If you fancy a super low-maintenance driveway that resembles ancient flagstones but has modern functionality, concrete pavers could be just what you’re after. Strong, safe, crack-resistant and available in an array of stylish hues, shapes and sizes, prices start at $54 per square metre. One word of advice: make sure you use a grouting system that keeps weeds and insects at bay, and that prevents moss growth. Concrete pavers also come in options where rainwater runs between each paver into a storage medium – ideal in extreme rainfall areas where runoff from hard surfaces overloads a property’s storm water systems. You might be interested in reading How much does an asphalt driveway cost? Note: Prices are rough approximations only, and Zones Landscaping cannot be held accountable for their accuracy. All prices in this article are exclusive of installation costs and any variations. If you would like to discuss options and ideas for your outdoor landscaping project, please use the enquiry form on this page to provide us with your contact details. We will get in touch with you at a time that suits you to discuss your landscaping design and build. If you would like to provide us with more information about your project, we have a more comprehensive enquiry form on our "Get in touch" page too.